basis for nearly a year (as a “special advisor” to the president). 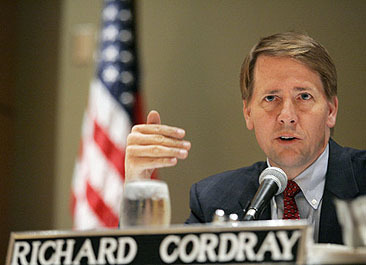 But opposition to her appointment is strong, and over the weekend Obama decided instead to nominate Richard Cordray, a former Ohio attorney general who’s been running the enforcement arm of the CFPB since December. What are the strengths of the way the CFPB is structured in the Dodd-Frank Act? There are many, especially the consolidation of consumer regulation and focus on research. But three structural strengths stand out: it has a single director, there’s been careful attention paid to its budgeting process and it is just like other regulators in terms of accountability but with focus on consumer protection as its primary goal. These three parts of the CFPB were carefully planned, designed and fought for. …. [Those three] major strengths — a director, funding and accountability with a focus on consumer protection — are exactly what the Republicans want to dismantle. No doubt they are trying to stall and annoy the implementation of Dodd-Frank and prevent the CFPB from doing all its work — of course they are — but if there were three critical points where they could significantly weaken what the CFPB can do, these would be those three. The real question is, why would anyone want to be this person? Richard Cordray knows what he’s in for, so why is he doing it? It’s mysterious. But then again, Cordray is a five-time Jeopardy! champion, so maybe he has something up his sleeve that the rest of us can only guess at. Wait and see.